Stunning sunsets and sweeping views make English Bay Beach (also known as First Beach) one of Vancouver's top 5 beaches. Located on Beach Avenue between Gilford Street and Bidwell Street in the West End, near Stanley Park, English Bay Beach in Vancouver is one of the most popular downtown destinations and is easily reached by transit. In summer, English Bay Beach is crowded with sunbathers, swimmers (it's one of the best beaches for swimmers in Vancouver), and volleyball players on the sand, as well as loungers and Frisbee players on the grass. Because of its urban setting — it's just across the street from bustling Denman Street, where there are loads of restaurants, gelaterias, bakeries, and shops — it's easy to spend the entire day at English Bay Beach. Since this is Vancouver — where casual dress is the rule — you can feel comfortable grabbing dinner in your beach-wear after a day in the sand-and-surf. 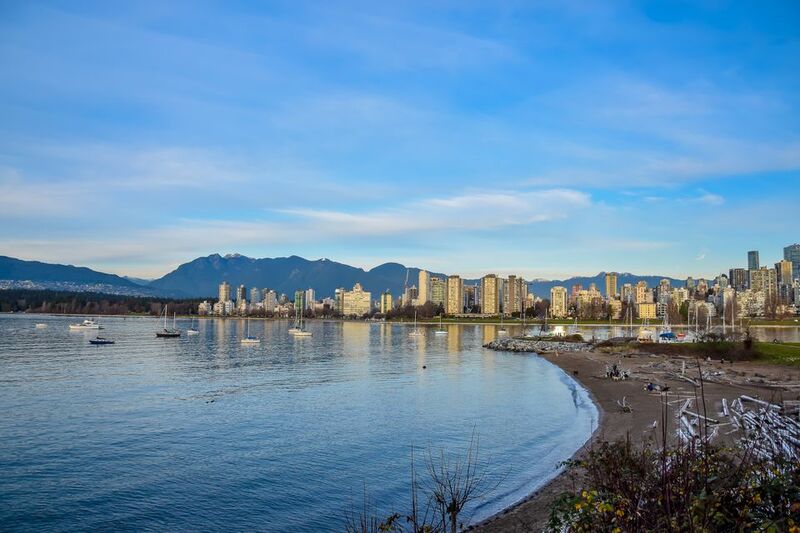 Even in the cooler months, English Bay Beach is a huge attraction for both locals and tourists alike because it boasts some of the most beautiful scenery in Vancouver. From the beach, you can see the mountains of West Vancouver and the beaches across English Bay, including Kitsilano Beach and Vanier Park. Unlike Kits Beach or Spanish Banks, it's not easy to find parking (even paid parking) at or near English Bay Beach. It's better to get to the beach via public transit (use Translink to plan your trip), or enjoy walking/biking/rollerblading along the seawall from areas farther east, like Burrard Street or Yaletown. Look out for city-wide Mobi bike share stands. You'll find several near English Bay so you can pick up and drop off a bike, or go to one of the many bicycle rental places in the area, such as English Bay Bike Rentals on Davie and Denman. One Mobi stand is located at Davie and Denman, next to the 'laughing statues' in Morton Park, which are officially called A-maze-ing Laughter and are a popular photo stop for visitors. Adventurous visitors can rent a kayak or stand up paddleboard from Kitsilano Beach or Granville Island to paddle across English Bay to the beach. Watersports fans can rent boards and kayaks from English Bay at Vancouver Water Adventures near the Lifeguard Station between May and September to explore the coastline of Stanley Park. Celebrations are central to enjoying English Bay and the beach plays a major role in two annual Vancouver traditions: the Celebration of Light International Fireworks Competition (held every year in late-July/early August) and the New Year's Day Vancouver Polar Bear Swim. The Celebration of Light International Fireworks Competition is three nights of spectacular fireworks displays held over English Bay, making English Bay Beach one of the top spots for watching the fireworks. During the Celebration of Light, English Bay Beach is absolutely packed — as in, standing room only — but the carnival-like atmosphere makes it worth the pushing-and-pulling for a spot on the beach. Head there in the late afternoon to make a day of it, or book a table at a local restaurant to guarantee a front-row seat. VIP seating and dinner deals are also available on the beachfront via the offical Celebration of Light website. At the other end of the weather spectrum, the New Year's Day Vancouver Polar Bear Swim welcomes in the new year with a traditional swim in the cold January waters off English Bay Beach. Held annually since 1920, the Vancouver Polar Bear Swim has grown in popularity every year; anyone can take part this event, as long as you can take the cold water. Join the thousands of brave locals in dressing up (preferably in something warm) and running into the water for a chilly dip!